While waiting on moving forward with the portrait piece I started to draw this one yesterday. My thought process was like usual. Start with a object/being and then build a story around that. I wanted to do something in regards to Illustration Friday, but the word "Shaky" just wasn't inspiring me. A friend of mine who is expecting was going to commission me to draw a piece for her nursery. Tho that is still something we want to do, now is not the time. So that inspired me. I started with a little boy on a giraffe. Loved the drawing, but just didn't know where to go with it. Do I put him in Africa? Do I just make it about the boy and giraffe? Or do I put more around them? I wanted to make a story out of it. I went ahead and made the piece 10x8, which gave me a lot of space to problem solve. Now what do I do with the space? I added a castle (Edinburgh Castle to be exact...loved Scotland), but that didn't make sense with the cowboy accessories and the giraffe. The story continued to grow. I then decided to add the unicorn and a wooden sword on his back. The story started to take shape. This little boy is in a dream, filled with things he loves. 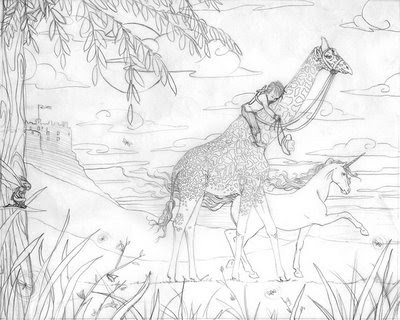 The little cowboy (probably fell asleep with the cowboy boots and hat on) mounted the giraffe for a safari, when that adventure was over they walked along the landscape and came to a castle where the boy became a cowboy knight and befriended the magical unicorn, now they're moving onto the next adventure. The piece was still lacking. What time of day was this dream taking place? It's a dream so anything is possible. There is a large full moon, but the colors in my head are magentas, purples, and blues. The foreground is as if the reader is looking into the dream of this little boy. And of course, I thought it'd be fun to add a fairy knight and some fireflies to add interest and more possible storyline. that is amazing. Check out my blog I am doing a giveaway to celebrate Nikki Shoemaker's new book, "What's Wrong with Mud"
i just got my copy of the new SCBWI magazine... was SUPER happy to see you had a few illustrations make it in! Maybe I will try to submit some again! They look great!! Congrats!